Himley clinched the Black Country Floodlit T20 tournament with a dramatic sudden death bowl-out win over Stourbridge. Heavy rain washed out the final and saw the week-long tournament decided by cricket’s version of the penalty shoot-out. Stourbridge went into a 2-0 lead and it looked like being enough for victory. But Stuart Wedge and Rajat Bhatia levelled for Himley, before Ryan Brown held his nerve to seal the win, sending Himley delirious. 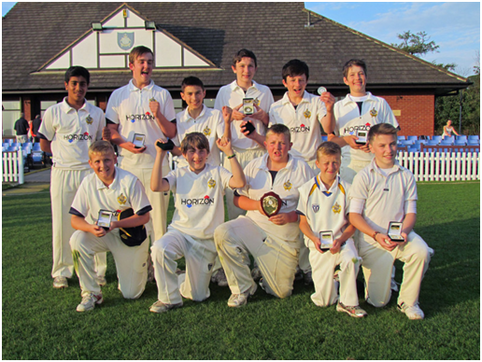 Having helped secure promotion for the Worcester League Second Eleven, the youngsters from Himley’s under 14's played host to Old Elizabethans on Sunday 9th September in the Worcester Cricket Board U14 cup. Himley won the toss and invited their visitors to bat first. Himley took an early wicket, Adam Passmore taking a sharp catch off the bowling of Arrun Bhogal. Old Elizabethans proceeded to score runs freely until the 14th over with the score on 79. Himley however stuck to their task, with the opening bowling pair of Jimmy Abbs and Arrun Bhogal to bowl the last four overs, Old Elizabethans finished on 99-6, with just seven runs coming off the last four overs. A target of 100, looked well within the grasp of Himley as Matt Bowen and Arrun Bhogal scored freely until Arrun was out LBW. Adam Passmore was bowled first ball, and from a promising start, Himley had to rebuild. Stephen Jones was next out for four to add to the home team's woes. This brought Dan Holmes to the wicket who together with Matt started to rebuild the innings. Matt provided the anchor whilst Dan played the more expansive role. Things were looking good until the re-introduction of Old Elizabethans opening bowler, who trapped Matt LBW for 23. With two runs to win, and Dan Holmes on 45, Dan decided to try and finish the game and get to his 50 in one shot but only succeeded in edging behind. James Stanley strode to the wicket, with one thing on his mind, to finish the match sooner rather than later as he smoked his first ball to the backward point boundary to complete a five wicket win for Himley. To cap a fine season Himley’s U15’s finished champions, won the Staffordshire Cup and finished runners up in the national final. The U12’s finished as champions of the Worcester CB Premier league. 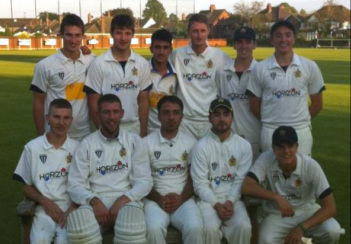 Himley’s representative teams in the Worcestershire County Cricket League also enjoyed success with the Second Eleven gaining promotion to Division Two, finishing second. What was pleasing was that again the youngsters played a huge part in overcoming much older opposition. Quality shone through on a consistent basis, fine batting from Charlie Mackelworth (ave 25.14), Arunveer Bhogal (ave 24.63), Matt Millward (ave 24.33) and Matthew Bowen (ave 18.05) all laid down a foundation for the bowlers with Joe Anthony taking 32 wickets with leg spin at an average of 10.31 including four, five- wicket hauls. The 2012 season witnessed some spectacular achievements despite the inclement weather. The First Eleven were in contention for the Birmingham Premier League title throughout the season, only to get piped at the post into second place behind Walsall on the last nail biting game of the season. The Second Eleven however, finished in fine form and enjoyed success amidst some fine cricket weather on the final day away at Water Orton, poised in second place with rivals Wombourne and Halesowen close behind. Water Orton started well and looked to be good for a possible 200-plus total. Only the fine spells of youngsters Andy Day and Ryan Brown could pave the way for Josh Holding, Jamie Turner and Himley paceman Danny Smith to curb the home side to 139 all out. With the hard work done it was left to the capable hands of Jaime Harris (16) Zane Shah (16) and Olly Westbury (15) to steer the Himley ship home. The youngsters showed great calm and class to raise more than three quarters of the winning total, only for the captain to steal the winning runs with an apt six, to start the celebrations. Himley’s young pretenders had finally produced the clubs longing of having their top two clubs in the top flight and after 12 years of trying can finally boast true Premier League Club status. Congratulations go to Jamie Harris (16) and Olly Westbury (15), who as well as helping gain promotion to the Premier League, have been invited on Worcester County Cricket Club Academy programme. Himley have had a successful closed season picking up awards. John Crawford was named as MCCC groundsman of the year and Greg Wright was named Bank's Trophy as Cricketer of the Year from the Premier League and has also been appointed captain of the post 1998 Premier League team which will be managed by our own Tony Lea- the pre 1998 team will be captained by Jonathon Wright and jointly managed by David Manning and our former club captain David Middleton, match to be played at Kidderminster on Thursday 11th July to mark the 125th Anniversary of the league. Congratulations also go to Andy Biggs who has been elected for a further term of office on the Management Board of the Birmingham & District Premier Cricket League- Andy deserves this vote of confidence from the member clubs as he is a very active Board Member and not just along for the ride- The other Himley members on the Board are Tony Lea who is an elected member and Tom Waterhouse as the Staffordshire Cricket Board representative. Summer is on its way and in order to get your club ready for the season we need your help. Players, committee members, members and supporters will be at the ground from 9 am on Saturday 6th April doing many jobs to ensure we hit the ground running for the following weekend. Please advise if anyone has any specialist skills that we can utilise on the day i.e. builders, painters etc, by emailing: groundforce@himleycc.co.uk - See you on the 6th April.